I’ve combined two of my favorite things today. Carrot Cake and Bundt Cake. Actually THREE of my favorite things…cheesecake. Oh wait FOUR of my favorite things…frosting! I clearly have a problem when it comes to choosing a favorite, but trust me when I say this cake is exactly what your Easter dessert table is needing. I have a classic Carrot Cake recipe on the blog already…and it’s a family favorite! But, I don’t normally put nuts IN my carrot cake. I did with this one today though, and oh my gosh, why haven’t I done that before? I also stepped up the “omg factor” by adding a ribbon of cheesecake. Top it off with some homemade Cream Cheese frosting and this is the cake of your dreams. Or my dreams. Or all our dreams. Actually, it’s a reality in my kitchen right now. I just keep attacking it with my fork! So does anyone else do that? 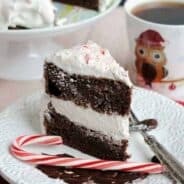 Keep making cuts into a cake with your fork? Nice even lines…until before you know it half the cake is gone? Oh? Me neither…I was just wondering. Start your day with this Cinnamon Apple Pancake. With all the Easter candy eating, you’ll want this light Raspberry Walnut Salad for lunch! Of course you’re going to make my Carrot Bundt Cake for dessert. RIGHT??? I’m nuts about nuts. See what I mean?!? Chocolate Frosted Cookie Bars. You can make them into footballs or cut into squares! 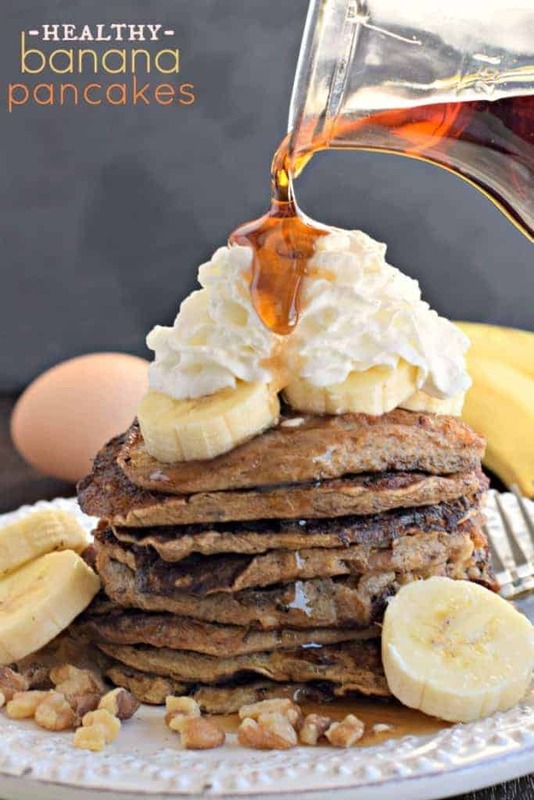 Start your day off right with these Healthy Banana Nut Pancakes. They taste like the inside of French Toast. YUM! 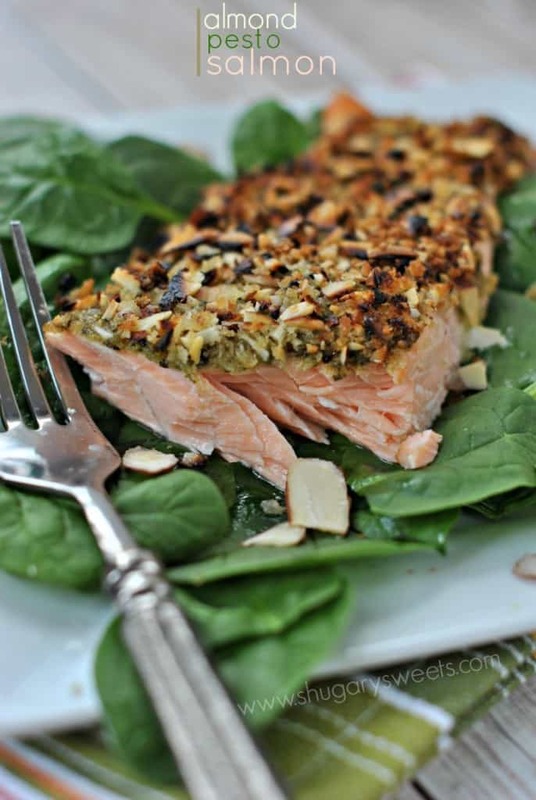 You are just a couple ingredients away from this easy, delicious Almond Pesto Salmon! Preheat oven to 350 degree F. Spray a 12 cup bundt pan generously with baking spray. Set aside. In a large bowl, combined all the ingredients for the cake, mixing until well combined. Batter will be very thick! Set aside. For the filling, beat cream cheese with sugar, vanilla and egg until smooth and creamy. Set aside. To assemble, fill bottom of sprayed bundt pan with about 3/4 of the batter. Spoon the cream cheese into the pan, being careful not to let it touch the sides of the pan. Spoon the remaining batter over the cream cheese layer. It's okay if it doesn't cover completely. 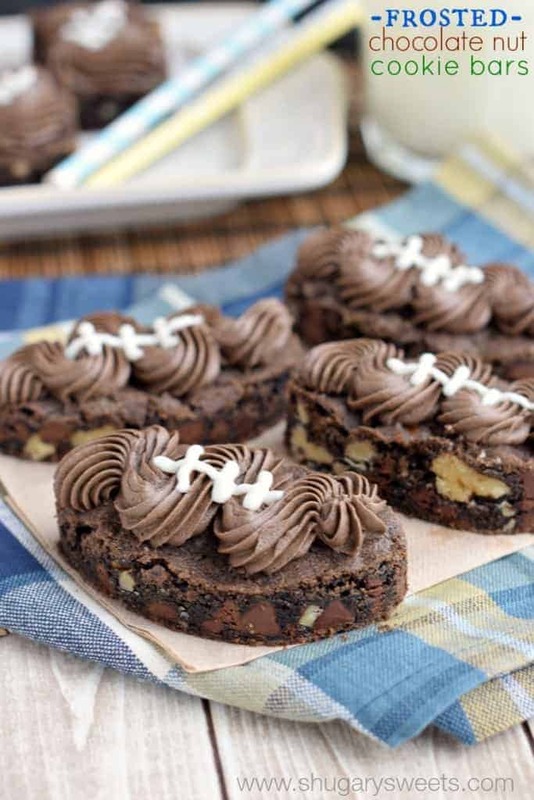 Bake cake in a preheated oven for 60-65 minutes. Cake will be browned and will pull away from the pan when done. Remove from oven and cool for 5-10 minutes before inverting onto a wire rack. Cool completely before frosting. For the frosting, beat cream cheese, milk and powdered sugar together until smooth and creamy. Pour frosting into a large ziploc bag and snip off the corner. Pipe onto cake, generously. 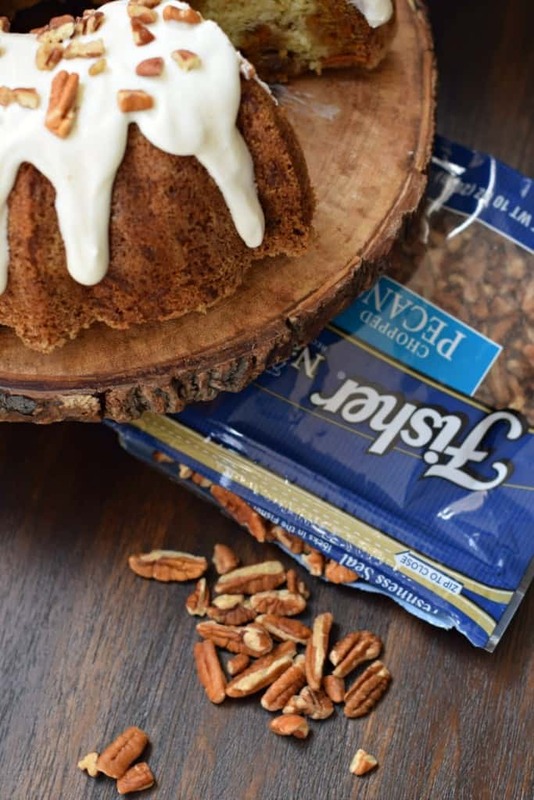 Sprinkle immediately with chopped pecans. ENJOY! This bundt cake is absolutely gorgeous! I think I would definitely keep attacking this cake, too. And since it has veggies in it, it counts for breakfast, right? 🙂 Pinned! This looks so good, I love carrot cake. Love the easy bundt cake version! I agree this might be the best looking dessert ever! Yum! I’ll be checking yours out! I’m always up for new carrot cake ideas! What a beautiful cake! Carrot cake is my favorite! This looks so good! Absolutely all of my favorites right here. Pinned! I have yet to find a carrot cake that I can resist. Looks like I need to add this to my baking bucket list! Out of all the bundt cakes I have ever loved (and there are many), none has ever had a cheesecake swirl. So this one and I might have to get serious. I love it! This cake looks fabulous! I’m dying over that cheesecake swirl! I love carrot cake, this looks amazing! This has to be more of the most gorgeous bundt cakes I have ever seen! It also happens to have a few of my favorite things too! Oh wow, this is incredible. 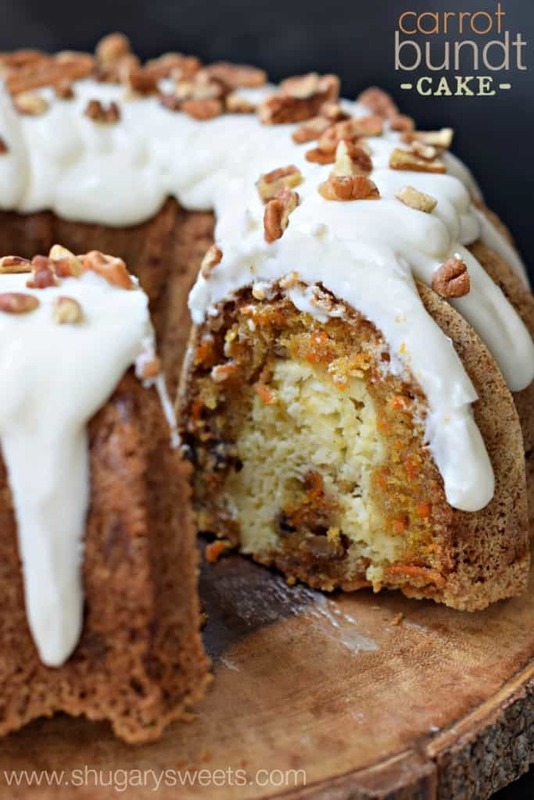 Cheesecake AND carrot cake all in one beautiful bundt cake. Love it!!! I’ll forgo the nuts (because of allergies in the house), but this looks awesome! This cake looks amazing! Perfect for the Easter season! This cake looks so great! Pinning. What a fantastic carrot cake!! Totally my favorite. Love nuts in carrot cake too. Pinned! Ooohhh four of my favorite things in one decadent dessert too! And yes… I attack dessert with a fork instead of cutting them because obviously there are less calories if I just eat a bite at a time right?! You are right, my Easter table does need this cake! Yum! 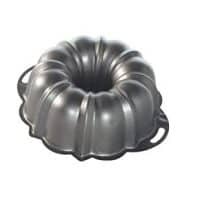 I just got a bundt pan and carrot cake is one of my faves! This is happening in my future. Enjoy the recipe Medha! Bundt cakes just taste better than regular, haha! Carrot cake is actually one of my favorites!!! And I love that cheesecake ribbon inside of course 🙂 Good to know that others cut clean slivers on their desserts too…I tend to keep making cuts and before I know it half of the dessert is gone. Whoops!!! This has like all of my favorite things in one cake! Looks soo good. Wow, now this is a dessert that I can get down with. This is a creative idea and I love it. I love cake and cheesecake, but it takes it to a different level when the two are combined. This bundt cake looks amazing! I can’t believe how pretty it is 🙂 I love carrots, and its the time of year I start craving carrot desserts. Looks YUMMY…Question is…Can I make it this week & freeze it til next week??? I haven’t tried freezing it. If I were though, I would freeze without the frosting…and put the frosting on after it’s thawed. Aimee – thanks for sharing this. I made it for Easter and it was delicious! I made this tonight and the plan was to have a bit and then he could bring it to work. I followed the directions exactly, no fudging including a generous coating of baking spray on the bundt pan . After the 10 min of cooling prior to frosting the cake I went to turn it over and the cake basically fell apart. I don’t know if it wasn’t cool enough or what. Should this have been baking spray with flour by chance? Yes it was good but I’m more upset about it falling apart. It’s a lot of work and time to make this and to have that happen is just totally frustrating. The baking sprays DO have flour in them. I’m so sorry it didn’t come out of the pan for you. I use a nonstick bundt pan, which may also help ease it out. It really should have flipped out, so without being there I’m not sure what went wrong. Because this has cream cheese does it have to be refrigerated? I would cover and refrigerate it after baking. ENJOY! This is the first comment I have ever made on a pinterest find. I followed the instructions and the cake turned out amazing. It looked just like the picture and was so delicious. Thank you, it will be a new family favourite from now on. Awww I love to hear this! I’m so glad it was a hit 🙂 Thanks for stopping by! I made this last night, and like a previous commenter, when I flipped it out of my bundt pan, it was all cracked and broke apart. I let it cool about 15 minutes prior and my pan is non stick and it flipped out easily, so it wasn’t an issue of it falling apart because it was stuck in the pan. Such a bummer because this was supposed to be my Easter dessert, but I will say the broken pieces were delicious! I made this over the weekend to see if I can trouble shoot for you guys, but mine turned out just fine again. I’m so sorry, wish I knew why that happened for you! Hi can you use Splenda or Truvia instead of sugar? Just made this cake. It is delicious but way to much sugar. Didn’t taste like a carrot cake, just tasted like sugar. I made this carrot cake for my family and everybody loved it. I was particularly surprised that the grandkids loved it seeing it was carrot cake. It was a hit with everyone. Will definitely make this Again. I might cut down on the pecans though. Just a little to much for me. Definitely a keeper. Love that your family loved it 🙂 Thanks for letting us know! Hello, I have made once already. Came out so perfect and delicious! I now would like to add crushed pineapple. Is there anything I need to adjust? Would hate to ruin this yummy cake. Thanks in advance. I’ve not tried that! I would just make sure you drain that pineapple so it doesn’t add extra moisture (you may need to cut back some of the liquid)! I made this cake today and my problem seems to be the same as a few other bakers. I followed the receipt except for I used coconut oil. I removed it from the oven after 55 mins. And after cooling for about 15 mins flipped the cake. It stuck to the pan so I smack it against the counter and flipped again. Half the cake fell out down to and including some of the cream cheese filling. It was a mess. My husband is sitting here eating it with spoon and says it tastes great. I think I will try one more time and use the vegetable oil and also leave it in for the full 60-65 mins. I can only say that given my directions are what worked. WHen you change ingredients and baking time, results will vary. Made this cake and it tasted great. However, the cream cheese filling did not float in the center. What could have went wrong? After flipping it out the cream cheese was all at the bottom. Thanks in advance. I just made this, and mine, too had all the cheesecake filling at the bottom, which was the top when baking. Suggestions??? Thanks! Although prep time was more than 15 minutes, this was easy to make. And so delicious! 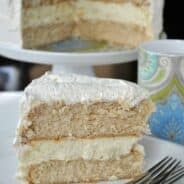 The cake itself is so moist and tasty, but then there’s that cream cheese filling and frosting! I’m a chocaholic, but I could eat this carrot cake every day. Thanks for this perfect recipe. I did add vanilla to the frosting, my personal magic in all frostings. How can this be covered to bake in a rectangular pan,ie: baking time? I made this lovely carrot cake for my Bunco group. They couldn’t believe it was home made. It was delicious and I had no trouble with the cake coming out of the pan in one piece. Just grease well and flour your pan before hand! Thank you for a wonderful tasty cake! I made the cake and waited about 30 minutes for pan to cool down then I tried to get the cake out of pan but unfortunately it completely feel apart. Maybe I didn’t spray enough butter or let it cool down enough, not sure. But I made due with what remained and still made the frosting for my broken cake it still tasted delicious to me, my brother and nephew. I definitely will try this recipe again. I think you let it cool in the pan TOO long. I suggest about 10 minutes next time (and make sure you use a baking spray, it has the flour in it already). I’m glad I found this! I will be baking his tomorrow. I made this for hubby’s birthday. His two favorites in one cake. Boy was it a hit. He absolutely loved it. Thanks for the fabulous recipe. Love how you combined two classics! Delicious! 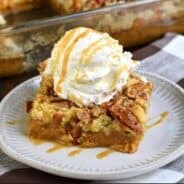 Hi there, I am about to make this recipe so of course I scanned the comments, and if I were you, I would specify in the recipe that if you don’t have specifically baking spray to grease the pan with, then to use oil and then flour. That’s what I am gonna have to do since I don’t have baking spray and I don’t want it to stick to the pan like what others have experience. I will be commenting back on here soon to let you know how it turns out! 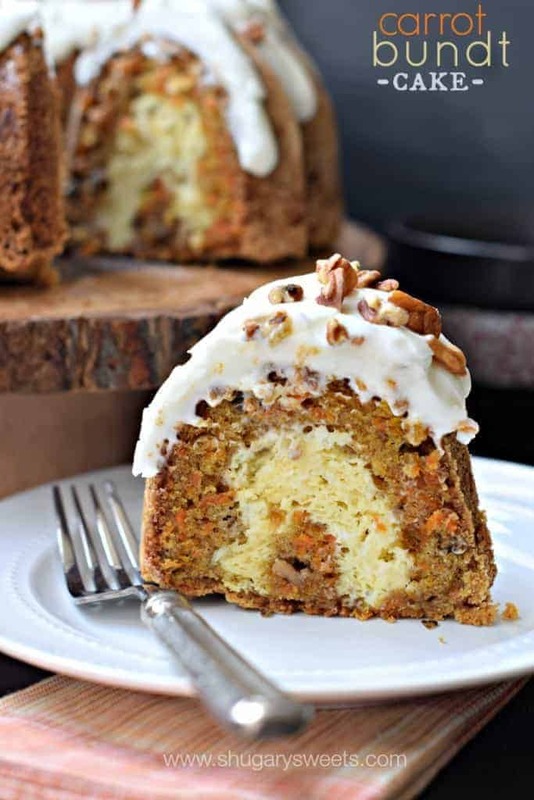 I looove carrot cake and I’ve been wanting to use my bundt pan, so this is a perfect recipe! Happy baking! Made the carrot cake bundt cheesecake. It turned out perfect I used Pam baking spray. It looks beautiful and tastes amazing!!!! I also love your recipe for the carrot cake cheesecake. Your recipes are awesome. Keep the wonderful recipes coming 😊. The cream cheese filling layer turned out too thin; I stayed true to the recipe. Tried adding 1/4 Cup powder sugar to try and thicken it. Still ran across the cake layer. I added raisins to the cake layer but no other changes. It slid out as promised and looks pretty, just wondered where I went wrong with the filling.